"A Champion for American Indian Students"
Urla Marcus is on enrolled member of the Northern Cheyenne Tribe from Lame Deer, Mont. 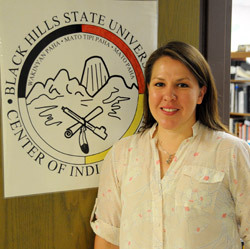 For the last eight years Urla has worked at Black Hills State University, first with Upward Bound, and currently as Director of their Center for American Indian Studies (Indian Studies center). She has a Master's Degree in Curriculum & Instruction from BHSU and is writing her doctoral dissertation on programming support for American Indian students and higher education. Completing her college education wasn't easy. Originally, Urla planned to study business. By her sophomore year, however, education caught her focus. "I was a first-generation, low-income student. I had no idea what I was doing or what support was available to me as an American Indian student. I saw that there was a need for a person who does what I do now for Black Hills State." This personal experience helps Urla be more effective in her role at the Indian Studies center. She realizes that someone needs to make the services on the BHSU campus visible for Native students and explain that they can be accessed without a formal invitation. In Urla's case, "It would have made it a little easier knowing the services were out there. Everyone seemed to know but me." Today, on campus and in the community, Urla is a champion for American Indian students. She prioritizes outreach with the ultimate goal of recruiting, retaining and graduating Native students. "We begin with these students on recruiting and registration days, and we stay involved with them every step of the way." Urla advocates for students by increasing their opportunities to know what programs are available, where to seek them out, and how to access them — all the things she wishes she had known as an undergrad. Urla says. "The support is there - it's a coordinated campus effort." Outreach also supports retention of American Indian students. Each year, Urla, the center, and Native student mentors shepherd about 30 American Indian freshmen onto the campus. Like all students, these freshmen must adjust to life on campus, the difference between high school and college classrooms, and being away from their families. Yet unlike other students, many Native students must also adjust to life off of the reservation. This is a huge transition that encompasses cultural, spiritual, nutritional, economic and lifestyle shifts that far exceed what non-Native students face. Native students also sometimes face the social pressures of prejudice. This steep transition is a major reason why only one in five American Indian students completes their first year of college. Urla acknowledges that first-year retention has always been a challenge for American Indian students, just because they're coming to a student population of 4,300. "It's easy to get lost in the crowd and to quit going to school." Urla says. "Building relationships between the students and the Indian Studies center helps us keep an eye out for our Native students. The whole campus works together to keep on track." This year, Urla and BHSU was one of nine colleges that partnered with the American Indian Education Foundation (AIEF), a program of National Relief Charities. Also located in South Dakota, AIEF offers a transitional training program and a transitional camp for partner colleges that want to improve retention of American Indian freshmen. Through the AIEF partnership, Urla started BHSU's "Bridge Camp" for Native students in 2010 — a transition model designed to increase competency and skills through a series of experiences that help the students transition from high school to college. The camp covered student services, degrees and career options, navigating BHSU's 26 buildings and 3 colleges, buying books, eating in the dining hall, moving into the dorms and living away from home. Urla reports that "the students who participated are comfortable, asking questions, and supporting each other on campus." Urla, BHSU, and AIEF do a great service for these students by instilling "college experience" before college starts — and thereby easing their transition to college and supporting first-year retention. Through the Indian Studies center, Urla also supports two student organizations that further support retention and graduation. The Lakota Omniciye that sponsors an annual Cultural Awareness Week to promote fellowship between Native and non-Native students, and the American Indian Science & Engineering Society that assists Native candidates for science, engineering and technology degrees. 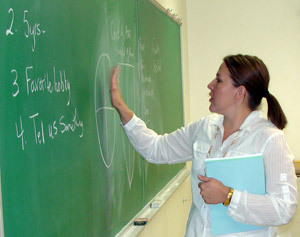 Urla is also a champion for American Indian students in her volunteer efforts, In April 2010, Urla co-presented at a journalism workshop on Preparing for Success in College and Beyond, along with colleagues from University of South Dakota and South Dakota Indian Education. Urla is also helping the South Dakota Science & Technology Authority (SDSTA) and the DUSEL-Sanford labs integrate American Indians into underground scientific testing and development operations. As a member of DUSEL's Cultural Advisory Committee, Urla helps DUSEL formulate cultural management strategies and objectives for recruitment and retention of American Indians and other under-represented groups. Whether working at the Center for American Indian Studies at Black Hills State or volunteering throughout South Dakota, Urla Marcus is always focused on education and always a champion for American Indian students.